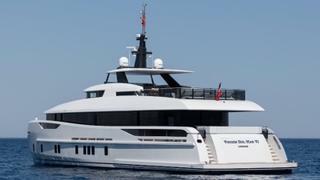 Turkish yard Alia Yachts has delivered the 31 metre “pocket superyacht” Virgen del Mar VI, which marks its 10th superyacht delivery to date. 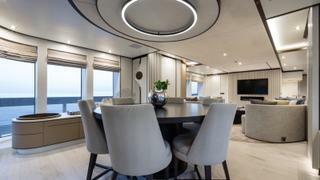 Launched in May and delivered in early July, the full displacement steel hull and aluminium superstructure was designed by Omega Architects and features interior styling by UK studio Redman Whitely Dixon. 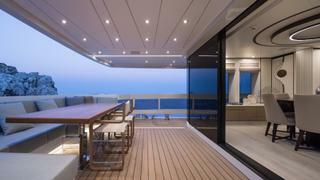 The 235GT yacht features a number of al fresco areas for sunbathing and dining on the main deck aft and on the 50 square metre fly deck behind the yacht’s raised pilothouse. Described as “fresh and airy", the interior design is populated with light oak and dark sycamore tones, with hand-cast bronze. Full-height, wrap-around windows allows the entrance of ample natural light. Accommodation is for ten guests across five cabins, including the 22.5 square metre master stateroom, which sits on the main deck and is flanked by two glass doors that enter onto the private terrace. The remaining four guest cabins, which consist of two doubles and two twins, sit on the lower deck. Alia president Gökhan Çelik explained why Virgen del Mar VI stands out in her field. While the yard has previously focused on custom production, Çelik said the reception to Virgen del Mar VI has convinced the yard to develop a mini-series based on her technical platform. This will include a 37 and 50 metre model. “Virgen del Mar VI started as a one-off project, but we have Letters of Intent to build further units with fully customisable interiors,” he said.